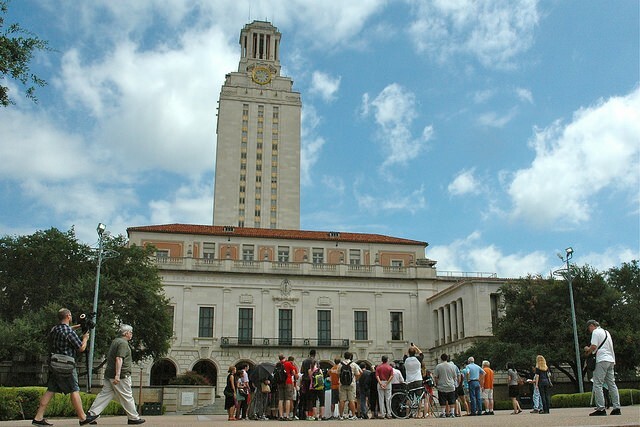 Living Memorial in front of the Tower at UT-Austin, August 1, 2014. 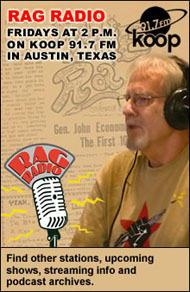 Photo by Carlos Lowry / The Rag Blog. 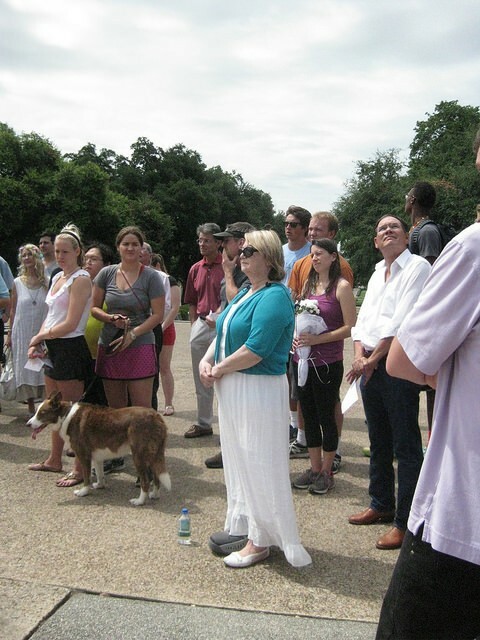 AUSTIN — Students at the University of Texas held a Living Memorial for the 1966 UT Tower shooting victims on Friday, August 1. Under a hot August sun, the students led a gathering across the campus from Littlefield Fountain to the Main Mall, the West Mall, and then to an area adjacent to the Turtle Pond on the north side of the Tower. Six times they stopped to hold up photos of the dead and read to those assembled a few words about the 17 lives that were lost. One of the victims recognized was David Gunby who died from injuries years after the event. His death was ruled a homicide. Charles Whitman had killed his mother and wife before he drove with his weapons and 700 rounds of ammunition to the campus. He killed a University receptionist and two people who had come to see the view of Austin from the 27th floor deck as he made his way on to the observation deck to continue his deadly mission. Tower shooting survivor Claire Wilson James at the Living Memorial on the UT campus. Photo by Alice Embree / The Rag Blog. A former Marine, he had been well trained at Guantanamo as a marksman. The first shot he fired from the Tower deck was aimed at Claire Wilson’s abdomen. It took the life of her eight-month old unborn child. His second shot killed Thomas Eckman who was walking beside Claire. Claire, just 18, was already a civil rights veteran, having been arrested in Dallas protesting a segregated restaurant chain. At 17, she joined a voter registration project in Mississippi run by the Student Nonviolent Coordinating Committee (SNCC), and then worked with the Southern Conference Education Fund (SCEF) in Appalachia. 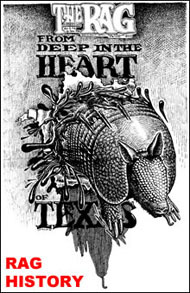 She joined Students for a Democratic Society (SDS) in Austin as did her boyfriend Thomas. It was through SDS that I knew Claire and another sniper survivor, Sandra Wilson, unrelated to Claire. Claire Wilson James traveled from Texarkana for the Living Memorial. Like many of the other older participants, her life had been forever changed by the event. Austin musician and satirist Artly Snuff and his wife were there as well. Artly was one of two people who braved bullets on the Main Mall to carry Claire to an ambulance. Claire and Artly only met in person last year. The University of Texas administration does not wish to have the memory of August 1, 1966, kept alive. Only a small plaque at the Turtle Pond commemorates the event. In 2008, a Travis County Building was dedicated to the law enforcement “Tower Heroes.” But, there is no list of victims’ names. 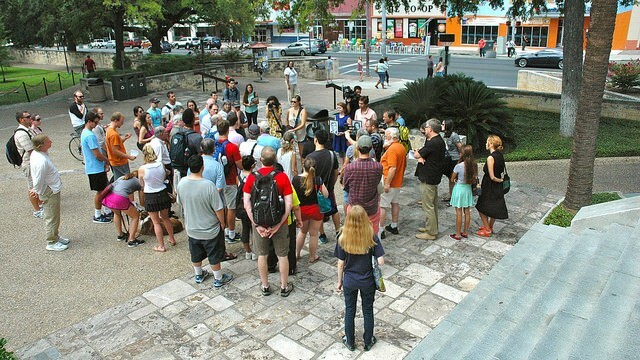 Students at UT-Austin participate in August 1 Living Memorial. Photo by Carlos Lowry / The Rag Blog. For those of us marked by this event, it was particularly poignant to hear the younger voices of Hannah Whisenant, Justin Perez, and Victoria Prescott recount the stories of the lives lost. So many of the lives taken were young people like the students holding their photos. 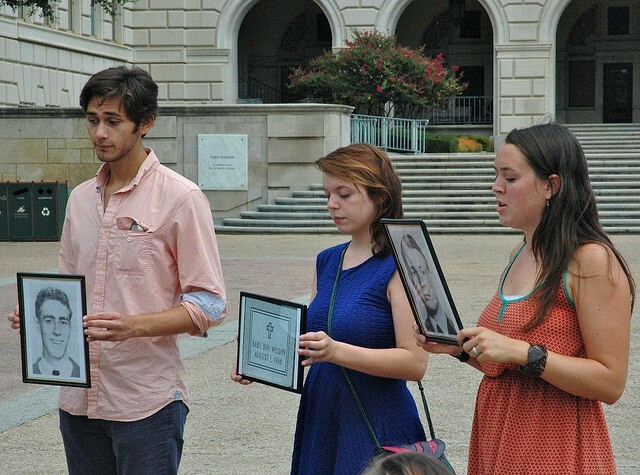 From left, Justin Perez, Victoria Prescott, and Hannah Whisenant read the stories of Charles Whitman’s victims. Photo by Carlos Lowry / The Rag Blog. Another person, a filmmaker, has taken on the task of remembering. Keith Maitland was there at the Living Memorial with his camera. He is working on a documentary film about August 1, 1966. 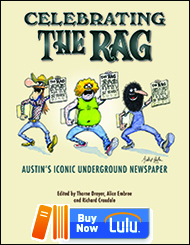 This entry was posted in Metro and tagged Alice Embree, Artly Snuff, Charles Whitman, Claire Wilson James, Gary Lavergne, Living Memorial, Metro Bloggers, Rag Bloggers, UT Tower Shootings, UT-Austin. Bookmark the permalink. Thank you, Alice, for a touching and meaningful story. I remember the event well because we heard about it on our camping trip in Colorado and called home to learn that my older brother had been on campus at the time, but was unaffected. It is important to tell these stories and to remember these folks who were hurt or killed. Yes, Alice, thank you for that well written coverage of the August 1 Memorial. I didn’t know all the connections between people I know. I was a few blocks away on that fateful day, watching the shooter hang over the limestone railing taking aim at those below. I had a tower view from the kitchen in my apartment on W 23rd and Rio Grande. I could see puffs of limestone as people fired at the gunman from below. I was cooking lunch. At one point a loaf of bread fell flat on the floor behind me. I jumped three feet. Then I went to the back room where he couldn’t see me and vice versa. Later that evening many of us mourned at Scholz Garten, drowning our sorrows in nickel beer that was being served to commemorate the 100th Anniversary of the historic saloon. Later on we went there in the same spirit of sorrow on the evening of the Kennedy assassination. This should be commemorated by the University of Texas. Thank you, Alice. I really appreciate reading this article and knowing about this very meaningful memorial. Thank you, Alice, and gratitude for the students who organized it and for Claire and the other survivors and family members. Thank you, Alice, for this excellent article. Thanks, Alice. My own experience was standing among a groups of OEO co-workers on the fire escape outside our office building over by the State Capitol building. We were incredulously following the news, seeing the puffs of smoke from where we stood….until we calculated and realized we also were standing within his killing range. The fact that UT has turned its back on the martyrs to this violent day is cowardly.